St. Petersburg, Hermitage, no. 21213. Pen and ink and wash, heightened with white, on yellowish paper, 26.5 x 26.5,1 cut in the shape of a triangle; laid down; wm?. Torn vertically right of center and horizontally in the middle, apparently along old creases; stained at the right center. 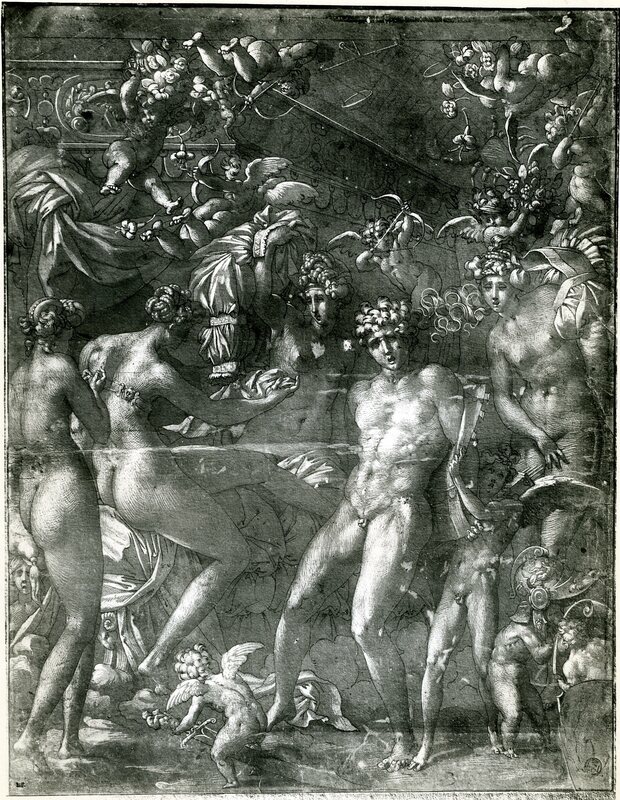 Inscribed in ink at the lower left: Rosso, and in pencil on the front of the backing at the upper left: Ecole florentine / 1541. PROVENANCE: Sir Joshua Reynolds (Lugt 2364); Edward Pearlf? (Lugt 893); came to the museum in 1925 from the Youssupov Collection. Dobroklonsky, 1940, 114, no. 327, as Rosso. Dobroklonsky, 1962, 11-15, 47, Fig., as Rosso. Carroll, 1964 (1976), I, Bk. I, 253, II, Bk. II, 409-411, D.47 (COPY), Bk. III, Fig. 126, as a copy of a lost drawing of c. 1533 – c. 1538; “Addition to the Preface,” 1976, vii, questioned as a copy of a lost drawing. Carroll, 1987, 35, n. 97, as a copy of a lost drawing by Rosso. 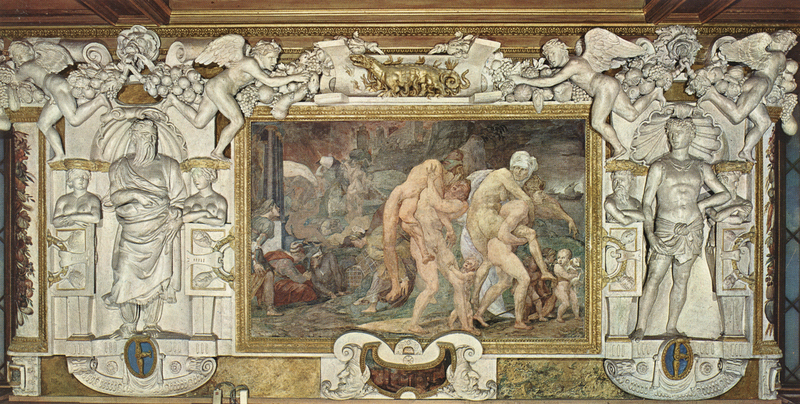 Vasari, 1568, II, 211 (Vasari-Milanesi, V, 170), after speaking of the decorations by Rosso that had been copied in prints, wrote: “si come sono ancora infiniti disegni, che il Rosso fece di saliere, vasi, conche, e altre bizzarrie, che poi fece fare quel Re tutti d’Argento, le quali furono tante che troppo sarebbe de tutte voler far menzione. E però basti dire, che fece disegni per tutti i vasi d’una credenza da Re,… e con si strane, e bizzarre fantasie, che non è possible far meglio.” The class of objects described by Vasari is known from several prints by Boyvin and his shop (RE.11,1-9) and by Fantuzzi, none of which, however, is inscribed with Rosso’s name. 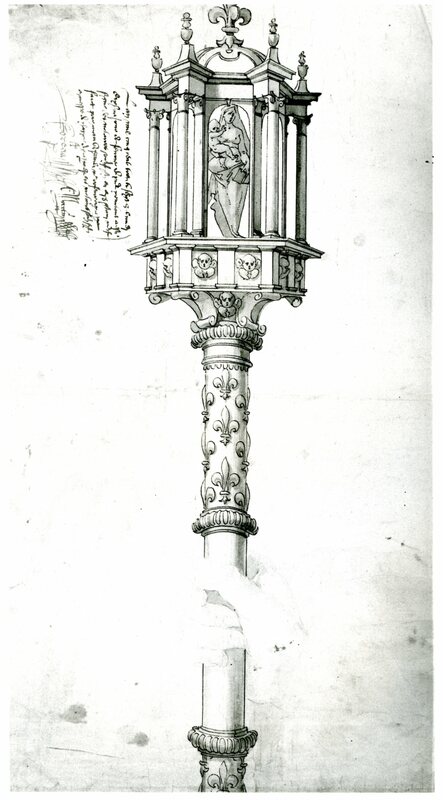 Aside from the St. Petersburg sheet, there are a few other drawings of similar objects, the finest one being that of a Covered Cup, in the Victoria and Albert Museum (Fig.RD.22), which is inscribed, and very possibly signed: Leonard Thierry. 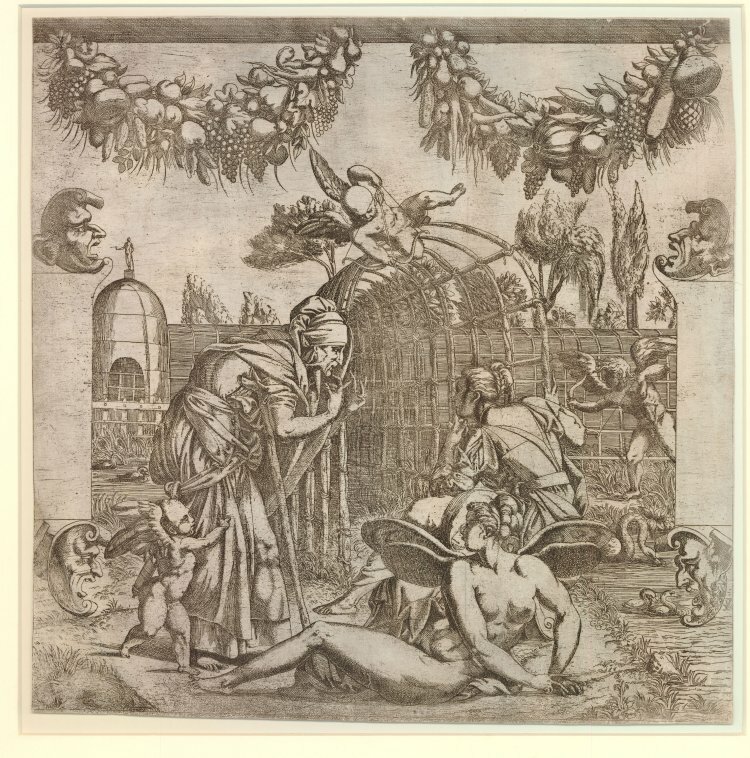 This drawing was used as the model for an etching by Fantuzzi (Fig.RD.22, Etching). Rossoesque as all of these works are, the design of none can be attributed to Rosso himself. These designs utilize a vocabulary of forms derived from Rosso’s mode of decoration but his forms are interpreted in a somewhat caricatural way and are combined in a manner that recalls Thiry’s compositions of the Story of Jason, engraved by Boyvin (RE.15). Some of the objects known from prints and drawings may be in various ways and to various degrees related to lost designs by Rosso. But the invention of these objects may have been left largely to his assistants. Still, it can be assumed that some designs of table service and the like were made by Rosso himself and the drawing in St. Petersburg seems to be a copy of one such drawing. The object represented in the drawing would seem to be a candlestick with the upper part of it cut off.2 At the top of the design, the seated youths with wings are quite like the stucco nudes above the Venus and Minerva (Fig.P.22, I N a), above the Twins of Catania (Fig.P.22, V N a), and above the Royal Elephant (Fig.P.22, VI N a) in the Gallery of Francis I. The small seated putto below is very much like the stucco putti at either side of the Cleobis and Biton (Fig.P.22, V S a), on the same wall of which are to be found masks of old men similar to those in the Design for a Candlestick. 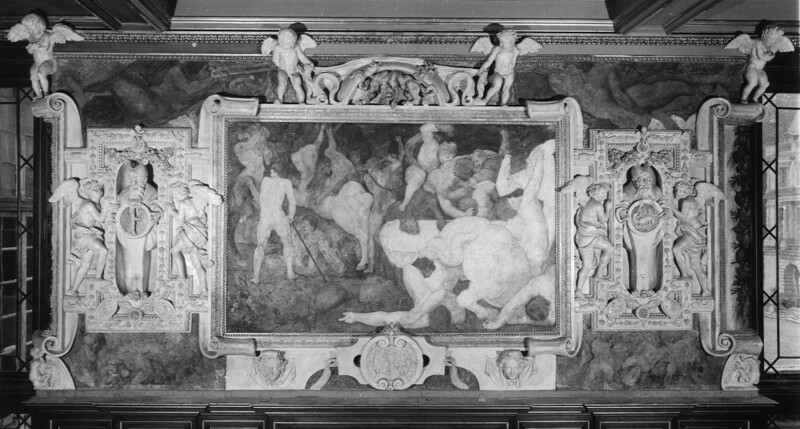 In the center of the drawing, the youthful head is similar to the heads in stucco beneath the Combat of Centaurs and Lapiths (Fig.P.22, I S a) and beneath the giants flanking the Education of Achilles (Fig.P.22, II N a). The salamanders are like most of the gilt ones in the gallery; their positions framing the lower part of the candlestick are similar to those of the dogs that frame the stucco relief beneath the Cleobis and Biton. 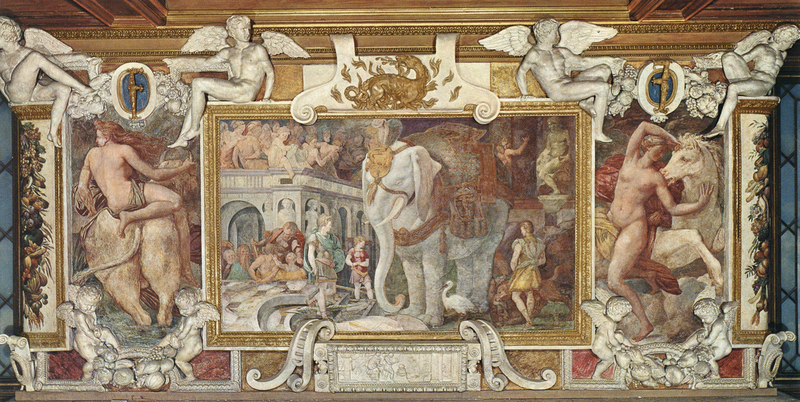 All these details are composed into a design the clarity of which suggests the order of the stuccoes on either side of that fresco. 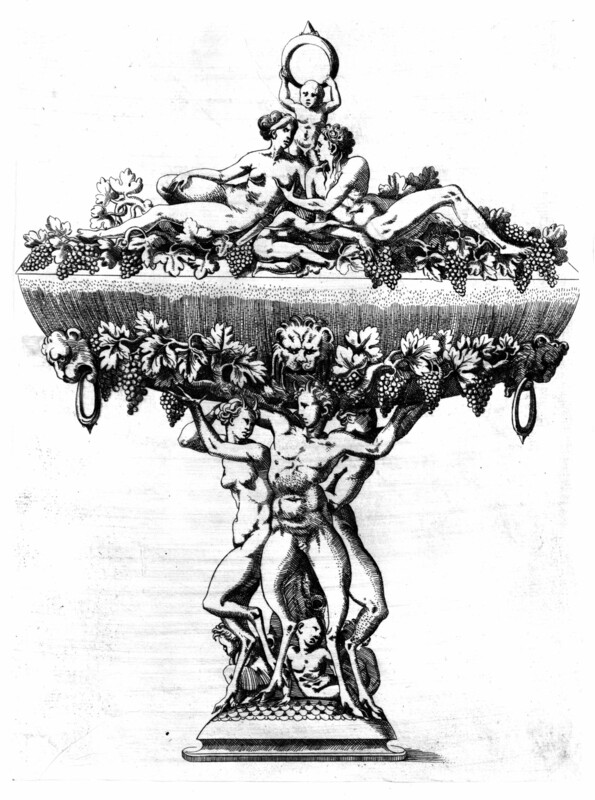 The character of the details and their organization in the Design for a Candlestick are more similar to what appears in the gallery than to what is found in many of the prints and other drawings of other such objects that are merely Rossoesque in their overabundant use of Rosso’s pictorial vocabulary. Although the draughtsmanship of the drawing, as it appears in a photograph – I have not seen the drawing itself – is too regular to be by Rosso himself, the penmanship does appear to copy his. 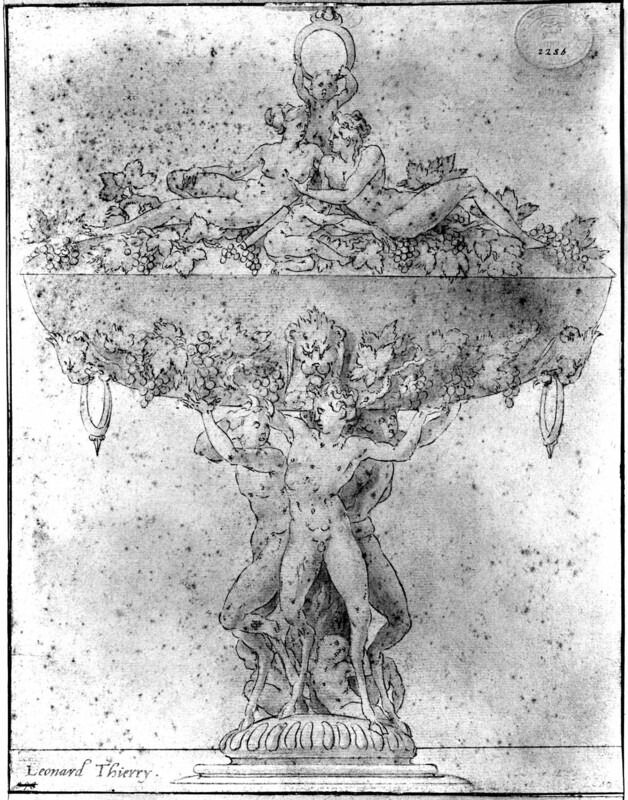 It is similar to that in the Mars and Venus of 1530 (Fig.D.42a) and in the Petrarch drawing of around 1534 at Christ Church (Fig.D.47a). But the St. Petersburg drawing also shows sequences of short pen strokes, curlicues, hooked lines, and undulating contours that closely resemble those in Rosso’s Pandora and Her Box of around 1536 (Fig.D.67a). 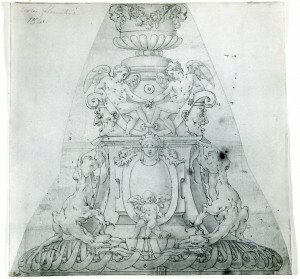 The washes in the Design for a Candlestick, which seem to have faded, are rather timidly applied, which is a characteristic of many copies of Rosso’s drawings. However, their placement in relation to the light falling from the upper left, and the use of washes on top of one another, suggest that they, too, derive their appearance from a lost autograph drawing. That drawing probably did not have the spirited aspect of the Pandora because it was made as the model for an object that was to be executed in metal by another hand. Hence, the original would have closely resembled the Design for a Gilt Silver Cantoral Baton of late 1537 – early 1538 (Fig.D.73a), the studied and precise draughtsmanship of which – but finer than that of the St. Petersburg drawing – is related to the function of the drawing as a model for a goldsmith. 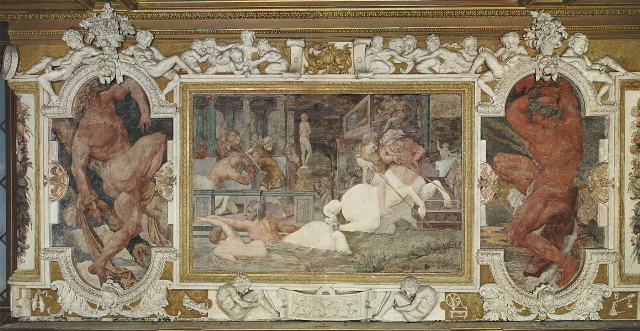 The large forms and clear composition of the candlestick suggest that it was done after the design of the stucco frames for the Pavilion of Pomona, known from Fantuzzi’s etching (Fig.E.62a), was invented around 1532 or 1533. 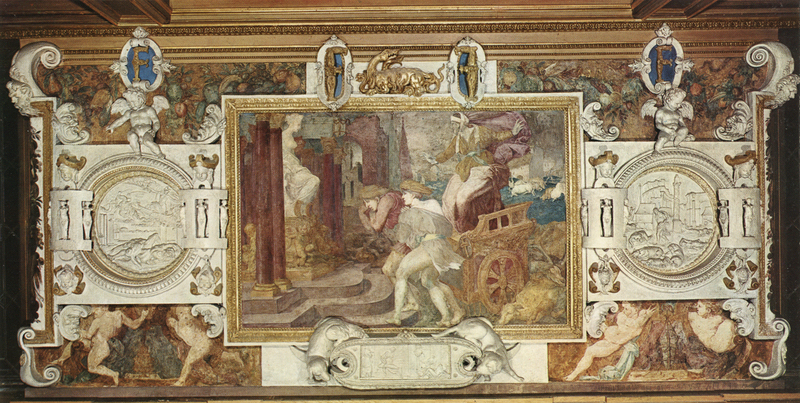 The drawing may also be later than the Petrarch drawing of around 1534, the frame of which is composed of a wider variety of rather smaller parts. 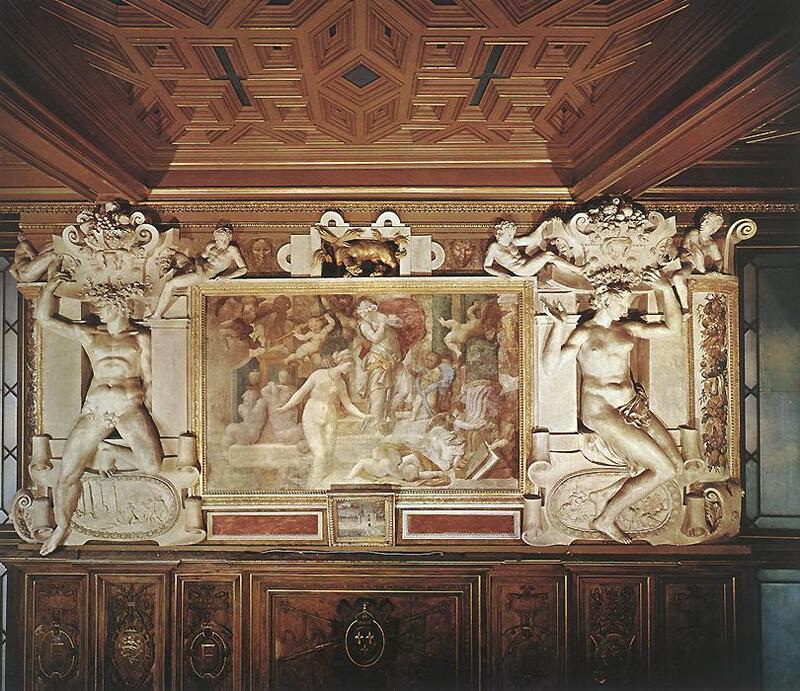 It is quite possible that the lost original drawing was done only after Rosso had invented such forms of which the candlestick is composed for the decorations of the Gallery of Francis I. 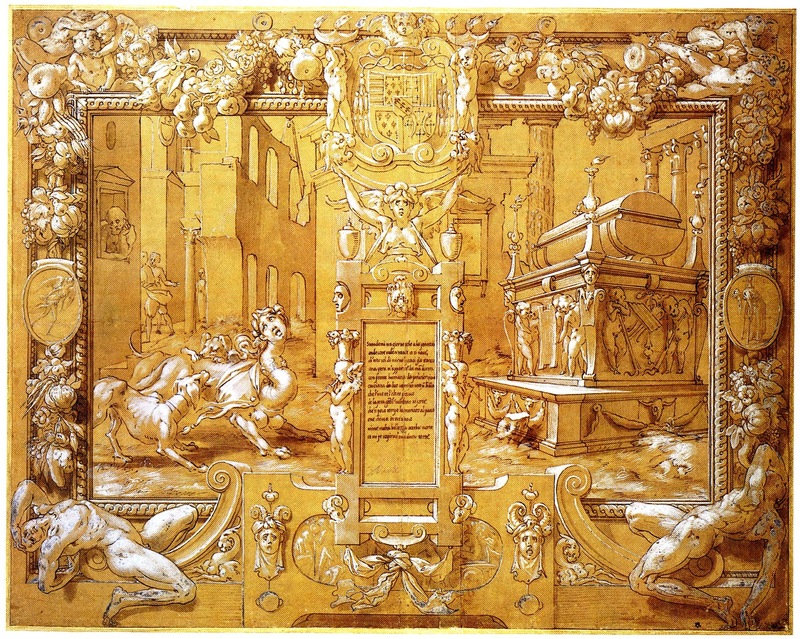 However, the drawing does not look like those works by Rosso that can most probably be dated after 1536; it has not the simplicity of, for example, the Design for a Gilt Silver Cantoral Baton. 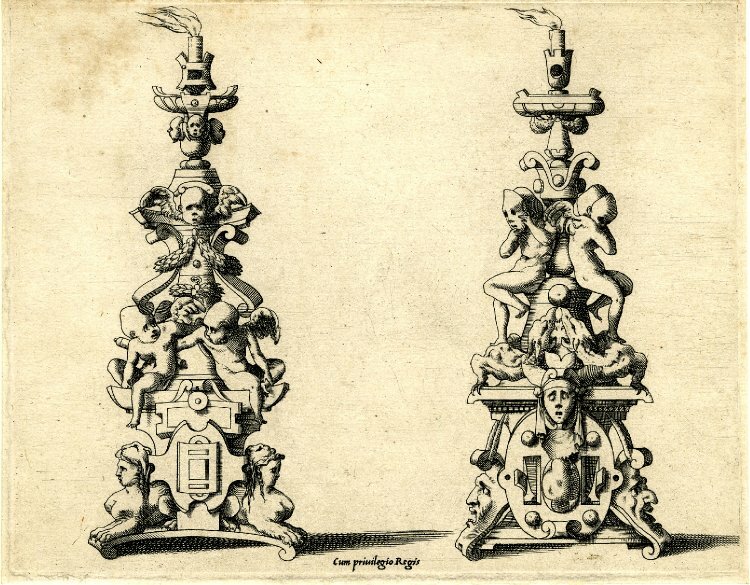 There is, therefore, some likelihood that the candlestick was designed around 1535 or 1536. The appearance of the salamanders with flames leaping from their mouths on the base of the object would seem to indicate that it was designed for Francis I. 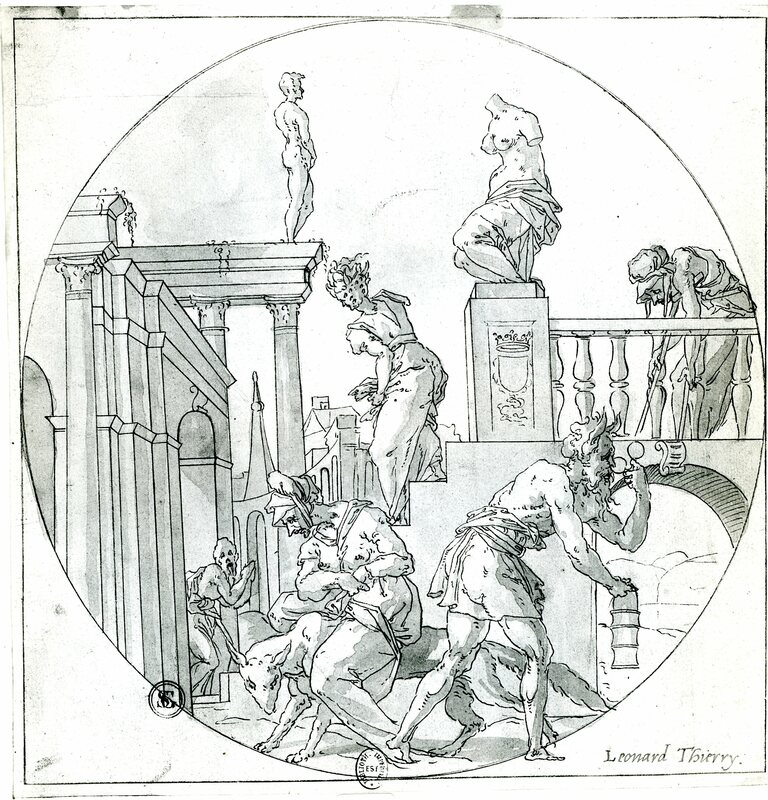 This does not appear to be by the same draughtsman who did the copy of the Covered Cup in London and the Allegory of Deceit in Paris (Fig.D.56) that reproduces a lost drawing by Rosso and that is also inscribed Leonard Thiry in the same hand. A degree of classic restraint preserved in this copy of the Design for a Candlestick, both in its composition and its handling, clearly differentiates it from the work of Rosso’s imitators. 1 This information on this drawing was kindly sent to me by the museum. However, a photograph of the complete drawing shows it to be slightly wider than it is high; also, no white highlights are evident; the paper would seem to be “yellowish” rather than yellow washed or prepared. 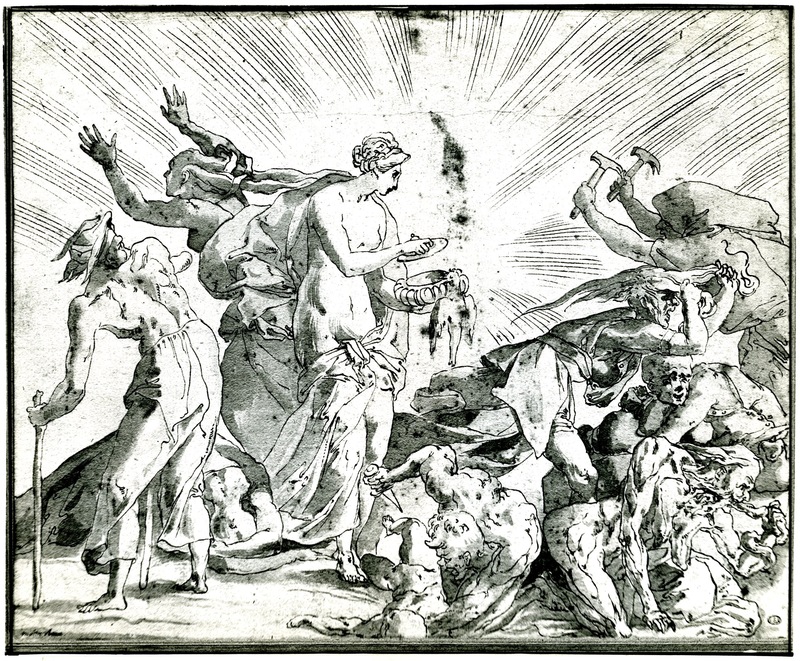 2 Of the kind shown in the print ascribed to Boyvin (Fig.RE.11,7).